It’s in the interest of our children’s health that we take steps to make sure they are physically active. But that’s not to say you need to impose a boot camp along with the 5-A-Day. We’ve put together 6 simple and enjoyable tips and ideas to help get your children moving. While they are great way to get children active and to socialise with others, weekly P.E. lessons or sports club practice sessions aren’t quite enough to help your child reach the recommend 60 minutes of daily exercise. Indeed, researchers in America have found that children actually spend 30 minutes of practice sessions completely inactive while activities are being organised. It’s also important to remember that not everyone will be drawn to organised sports such as football or netball. Think outside the box for activities your child will enjoy, such as like dancing, rock climbing, or martial arts. Patience is key – it may take some trial and error before your child finds their activity, especially if they are not naturally athletic or are self-conscious about their physical ability. Change up the school run and have your children walk in or take the bike, both of which count as great exercise. This will also allow your child to arrive refreshed and ready to learn, and reduce congestion at the school gates. As we looked at in the last blog, the key to getting children active is for exercise to be enjoyable. 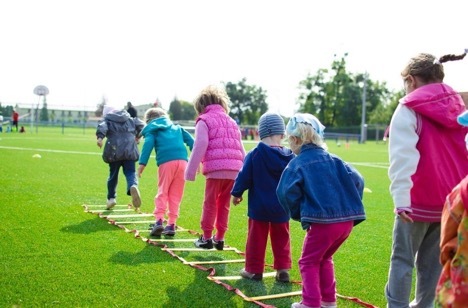 In addition to more ‘alternative’ options for sports to try such as dancing or rock-climbing, encourage children to make up their own games and look out for events and initiatives which will encourage exercise. For example, Change4Life is running a ‘train like a Jedi’ programme this summer, using Star Wars to excite children to take part in a series of active games and challenges. While it’s important to make firm efforts to get children exercising, this shouldn’t turn it into a punishment. Rather, suggest playing outside as a break from homework, or organise social activities based around playing outside instead of a games console. The American Academy of Pediatrics recommends that children have no more than one to two hours of screen time a day. Give your child a chance to be inventive – take away the temptation of the TV or games console and encourage them to find ways to get active instead. Active parents make for active kids. A recent University of Bristol study found that 11-year-olds showed greater physical activity than their peers if their parents had a history of using the gym at least twice a week. By the same logic, if your child sees you glued to your phone or TV, they’re likely to follow this example. Also, try to play alongside your children in order to encourage them – you’re sure to have forgotten quite how exhilarating Hopscotch and Grandmother’s Footsteps can be.